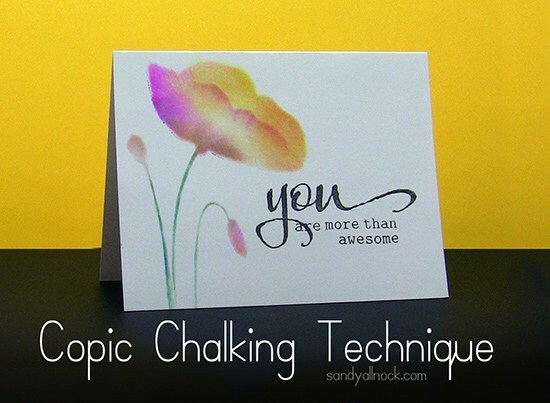 I’m excited to be bringing you a fun and easy technique today…a technique for Copic + stencils, and paper to look like chalk! I chose a Penny Black stencil called Sun Catcher – a huge flower without detail on the inside. I show you in the video how to create that second petal in front. I love how each flower comes out looking entirely different every time! I made a bunch of these and mailed them to my patrons recently. Check out the video below to see how I created it….it’s sooooo easy! If you have trouble viewing the video below, click HERE to watch it on YouTube. The sentiment set is called The Big, The Bold, and You….Winnie and Walter is really BIG on sentiments! And you can also try this technique with other markers and inks as well; for fluid, use whatever you would normally use to clean the medium off the stencil. Just be light with it – heavy fluid will make some cool effects too, but won’t come out like chalk. SHOPPING ALERT: RANGER PRODUCTS ARE ON SALE AT SIMON THIS WEEKEND. Just sayin’. Click HERE if you need stuff! Thanks for visiting – I’m off on vacation, but my blog’s scheduled like mad…so keep on visiting! 🙂 I’ll have some #BTS pics of the trip over on my Instagram, so keep an eye out over there too! Copics + stencils…I wonder what else can be done with them next!? Wheeee! This is amazing! Love the soft look! Sooooo pretty! Can’t wait to try this technique. Amazing! I wish my mistakes turned out so well! Thank you so much for sharing this technique! I love it and am super excited to try it out! I really liked how simple it was yet elegant looking. I’m going to try it at my next card class. Even beginners should be able to do it. Wonderful technique. I am going to try it, thanks. Loved the technique. And I do love your intro. You are just so talented! Love your cards and the new technique. I will be trying. Love the intro as well. What a wonderful technique. So glad you created it. thanks. What a great card, awesome, and so are you for sharing this wonderful technique. The card is fantastic. Sandy you are a true artist! It’s just fascinating to watch your videos. Thank you so much for sharing your talent!!! Beautiful! Can’t wait to try this technique. Thanks for sharing. WOW!!!! Will give this a go later today! A way to use stencils and Copics together? Yesyesyes! Sandy, you are beyond amazing. I love, love, love this technique!!!! Beautiful technique. Wish I had a stencil right now to try it out. failure is often the first step to success and this is success. So beautiful Thanks for sharing it with us. What a neat technique. Love the look you get from it. Another use for stencils. Thanks for sharing. Oh, I do like your intro and exit. I see you used your favorite color. Wanda, there’s a link at the end of the post. This is a fantastic technique, Sandy!! I love to learn new techniques and you make this look very easy! I’m excited to try it out! And your new swirly is divine, dahling! How fun! Thanks for sharing and I hope you’re having a nice trip! I just love how oopsies can be turned into wonderful things, like this technique. 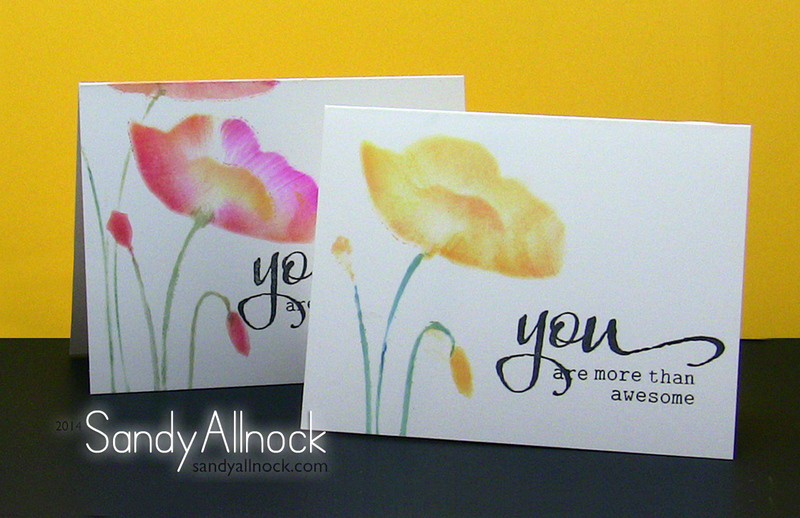 Wonderful chalky-effect and beautiful card. I’d never bought the big open stencils like this because I never knew what to do with them, until now. This stamp set is truly on my wish list. Your new intro/exit is really beautiful – I’m a big ‘swirl’ fan; and love that you’ve put it with your fave color – it’s so you! Hope you have a fun vacation! The intro and out-tro(!) look so professional! Totally worth the effort it must have taken. I can hardly wait to try this. I love the soft look! This is beautiful Sandy! Thanks for sharing. Just a quick Hoozah for your new technique, so pretty…gotta go now and try it out for myself. Bye. Very cool…You are SO freaking creative!! And now I have to go buy that stamp set…cuz I love it!! Amazing technique!!!! Such gorgeous results!! When do you use Neeah’s 110# vs 80#? I just got my first batch in and am loving it! I love the beginning! Yellow!! What a cool technique, that looks amazingly easy. This is great. I love my Copics and now I have a good excuse to buy more. I’ll try this today with a rose stencil I have. Thanks for sharing and I do like the new intro and ending. Love the chalking technique. Thank you so much for sharing. A happy accident as my Mum used to say! What a beautiful technique. I really liked the new intro too. BTW, I think you need to start including your nail polish color in the doobliedoo! Sometimes our mistakes can create real works of art! This is a great, easy technique. I think it’s absolutely beautiful!!!! I think that it’s wonderful that you are so willing to share you gifts with others. Thank you so much! Holy smokes this is amazing! Off to try it ….. thanks so much.